THERE has been a real rush in recent times on Irish history anthologies. Some recent examples would include Richard Aldous and Niamh Puirseil’s We Declare: Landmark Documents in Irelands History, which was a follow up to their Great Irish Speeches. The most recent anthology I’ve seen is Seán McMahon’s Great Irish Heroes, and now Joe Ambrose’s The Fenian Anthology. Apart from The Fenian Anthology, what they all have in common is that each speech or document can be read in isolation. Joe Ambrose’s The Fenian Anthology was different, though. This book focuses on a specific group. On its flycover we are told the book will “broaden our understanding of the word ‘Fenian’” and reclaim it from “bigots and foes that, for a long time, used it as a term of abuse to put down those who believed in Irish independence”. The anthology includes “speeches from the dock, extracts from memoirs, ballads, novels and correspondence” which would “demonstrate a sophisticated Irish patriotic tradition”. Unfortunately, I found none of the sophisticated tradition. 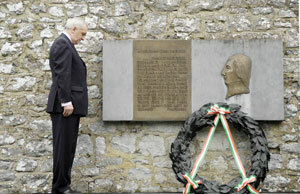 However, it did correctly chart the origins of Fenianism to its primary source in the United Irishmen. It also threw up a few surprises. While the book begins with Wolfe Tone, followed by Emmet, Young Ireland, and the Fenians, it finishes with Bertie Ahern and a speech he made at the 150th anniversary of the Young Ireland Rebellion 1848! Coupled with this, in amongst the speeches from the dock, extracts from memoirs, ballads, etc, Ambrose places himself amongst these bold Fenian men with narratives of the people, politics and his own particular view of them. For the history of the Fenian organisation, Ambrose relies heavily on James Savage’s Fenian Heroes and Martyrs (1868). As a result he concludes that the Fenians were essentially an American phenomenon, a natural assumption based on the source used. If the history had been broadened to include Joseph Denieffe’s A Personal Narrative of the Irish Revolutionary Brotherhood or Fenian Memories, by Dr Mark Ryan, a much different conclusion would no doubt have emerged. While these books are now difficult to obtain, Owen McGee’s The IRB: The Irish Republican Brotherhood from the Land League to Sinn Féin (2005) is one of the most detailed, accessible accounts and, unlike some attempts, it does put the Fenians ‘in context’. The Anthology contains some very large extracts from a limited number of Fenian writings; smaller and more focused pieces on their politics could certainly have helped to demonstrate their refined political ideology. 1916 is covered by Pearse’s speech at the grave of O’Donovan Rossa, Connolly’s article from The Irish Worker on Physical Force in Irish Politics, and a piece by Ambrose on the history of the national anthem. There are four pieces on the Tan War and Civil War, the most interesting being Collins’s The Path to Freedom. By far the most laboured chapter is titled The Modern World. With regards to Bobby Sands, Ambrose again suffers from lack of research and he relies primarily on discredited anti-republican sources. This deficiency was only made up for with extracts from Bobby Sands’s diary, taken from his Writings from Prison. To suggest that Bobby Sands stands anywhere other than within the long Fenian tradition of prison struggle is to suffer from a contemporary historical malaise. Sands is a direct inheritor of Tom Clarke’s politics but I fear that Ambrose is an inheritor of the less sophisticated Irish political tradition of Free State revisionism. The book, unfortunately, lacked depth and scope, and I would put this down to narrow research on behalf of the compiler.